So, the good people of England are very excited that their cricket team is actually doing really rather well. For English cricket fans, it doesn’t get a whole lot better than trouncing the Australians in their own backyard. After two games of a five game series, England are 1-0 up (the first Test was a draw), and *whisper it* look like they just might be strong enough to win their first Ashes series in Australia since 1986/7. There have been a number of fantastic performances, but you either know about them already, or can find much more eloquent words about them elsewhere. Today, I’m going to introduce a little-known hero from the Second Test. Ladies and Gentlemen, may I introduce to you Mr Kevin Howells. As far as I can ascertain, Kevin Howells is the ‘reserve commentator’ for the BBC’s Test Match Special radio programme. This seems to involve sitting in a London studio throughout the night, watching the cricket, and being on hand should the line to Australia fail. This seems, in some ways, the perfect job. What cricket fan wouldn’t want to be paid to sit in a darkened room watching the Ashes? Then again, how nerve-wracking would it be to know you might get called upon at a moment’s notice? Well, that’s what happened to our hero this past weekend. The line to Adelaide went dead, and, with barely a few seconds notice, Howells was on air to the nation. He had no co-commentator to bounce off, and no adverts or news bulletins to allow him a break. He had to talk and talk and talk, explaining the unfolding events on his monitor and avoiding, at all costs, dead air. There can’t be many broadcasters who could do this at a moment’s notice. As much as I’m sure he was relieved when the line to Adelaide was re-established after half-an-hour or so, he sounded like he could have commentated all night. Kevin Howells – I salute you! I have not been staying up to listen in to the matches so far – but may well do as the series dfraws to a close. 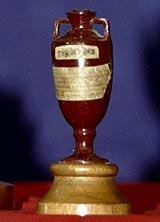 And I’m not much of a cricket fan but do love the Ashes series. Five years ago I was best man for a good friend and the wedding was slap bang in the middle of the final day of the last Test. Several people were receiving updates on their phones and even the groom was keen to find out if we’d beaten Australia come the last ball. It felt a bit naughty but also just the sort of irreverant fun English folk ought to be having during a lovely sunny wedding day. Maybe we should have invited Kevin Howells? It seems that for any major social event you need to check the sporting calendar first. I remember going to a school ball in my youth that was pretty much ruined by the fact that all the boys were gathered around a tiny telly watching an England World Cup game. Maybe Kevin Howells can start moonlighting as a mobile commentator at events that clash with the cricket? This Kev Howells chap seems to have a pretty decent job nailed down. Heck he could probably snooze through the night as I’m sure the phone would ring and wake him up if he was actually needed for once. Jammy git, what a job! Ah…but if he snoozed he wouldn’t know what was going on! Must be bizarre for him now, as the odds of him being called on again this series must be pretty long. Great job, though. Thanks for popping by and for sharing your post. Hopefully see you back here soon.